Royal Air Force Master Aircrew Keith Wing, 56 Squadron Rivet Joint specialist, clears snow from the grave of U.S. Army 1st Lt. Jarvis Offutt February 2018, at Forrest Lawn Memorial Park, Neb. Wing prompted the process of having the gravestone raised to make the full inscription legible. 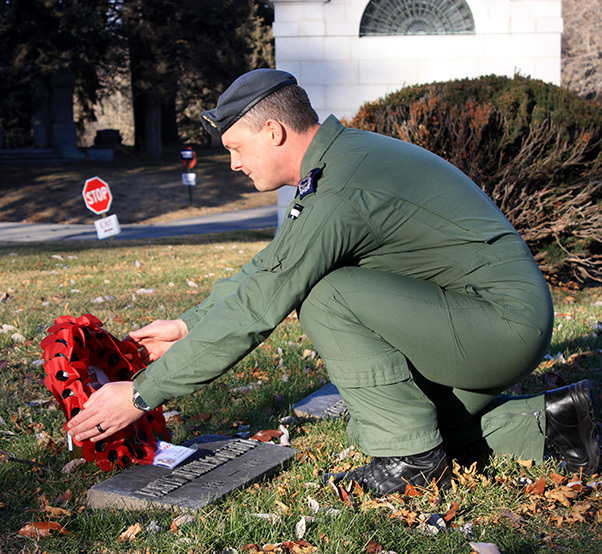 The recent restoration of 1st Lt. Jarvis Offutt’s grave was sparked when a Royal Air Force Rivet Joint specialist, assigned to RAF Waddington’s 56 Squadron visited his grave to pay respects to the former squadron member in December 2017, at Forest Lawn Memorial Park, Neb. Offutt had been a part of 56 Squadron for approximately a day before he died in flight over France. Warrant Officer Keith “Nutty” Wing visited the grave during a visit to Offutt as a liaison with the 55th Intelligence Support Squadron. The Rivet Joint specialist works in an operational test and evaluation role, in which he gathers data on RC-135 aircraft to provide information for RAF leadership, allowing them to make informed decisions. Wing comes to Offutt three or four times a year in a liaison capacity. The first time Wing visited Offutt’s grave was to lay a wreath on behalf of his squadron the day before he was due to return to the United Kingdom. Whilst there he noticed the grass had overgrown the gravestone and used his aircrew knife to trim it. This field cleanup revealed an inscription, which had been buried because the stone had sunk about five inches into the ground over many years. 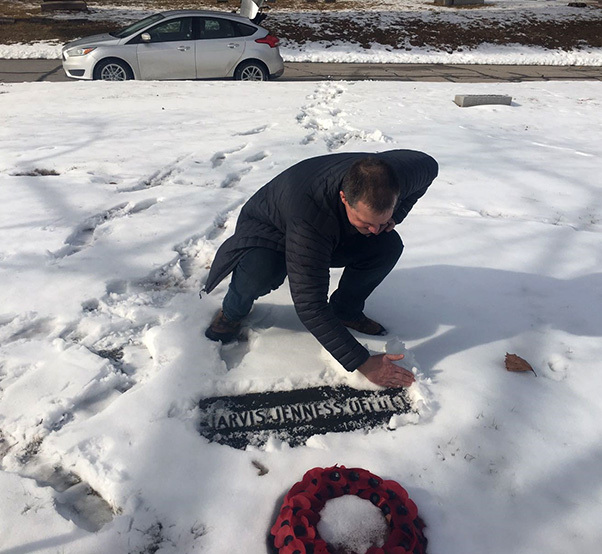 Wing returned in February 2018 with Kenneth Bauer, 55th Wing Plans, Program and Requirements international program officer, with tools to clear away the ground and make the inscription more legible, but the frozen ground prevented them doing as complete a job as he had hoped. The two even enlisted the assistance of two somewhat bemused ground maintenance workers to lend some stronger tools. Royal Air Force Warrant Officer Keith Wing, 56 Squadron Rivet Joint specialist, places a wreath at the gravesite of U.S. Army 1st Lt. Jarvis Offutt Dec. 18, 2017, at Forrest Lawn Memorial Park, Neb. When Offutt died he was a member of 56 Squadron. Bauer and Wing work together during his liaison visits. When Bauer learned of Wing’s actions to improve the gravesite he began taking steps to improve it further. The work to raise the headstone was completed May 1, 2018. 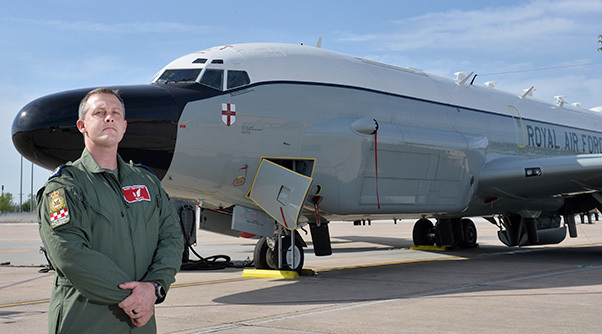 Royal Air Force Master Aircrew Keith Wing, 56 Squadron Rivet Joint specialist, poses in front of a RAF RC-135W Rivet Joint aircraft May 8, 2018, at Offutt Air Force Base, Neb. Wing prompted the process of having the gravestone of U.S. Army 1st Lt. Jarvis Offutt raised to make the full inscription legible. Wing was thrilled to hear that the gravestone had been preserved for the future. Now, the full inscription of the headstone can be read.